I’m very excited to be back here at the Jolly Jabber! Kimberly has created another Scrap Basket Sensations Quilt Club using my latest book, Scrap-Basket Sensations, published by Martingale & Company, along with Moda’s beautiful Jelly Rolls. I know you’ll love the Jelly Rolls she has chosen for each kit -- they’re absolutely gorgeous! She has a gift for choosing fabrics that work really well with a pattern. I love working with 2 ½” strips. This size is large enough for cutting into smaller pieces, but small enough for strip-pieced designs. And because the fabrics are so gorgeous and the strips are already cut, I’m crazy about Jelly Rolls. Occasionally, I’ll make an entire quilt using only one Jelly Roll, but for the most part, I use Jelly Rolls as my stash. As soon as I bring them home, I unroll them (yes, really!) and store them in shoebox-size storage containers. I really appreciate the fabric designers who incorporate at least one color used in a previous line into a new fabric collection. Mixing up the collections gives me a greater variety of prints, resulting in a really scrappy look. My obsession with quilting began in 1988. Using Judy Hopkins’ Ultimate Book of Quilt Block Patterns, I cut mylar templates, tracing each shape onto fabric, then cutting each piece with scissors. I hand-pieced a huge stack of blocks for a sampler quilt. Actually, I probably had enough blocks for three quilts. And I never made the sampler quilt. By the time I had the courage to put the blocks together, the fabrics (blue, mauve, and peach calico prints!) didn’t appeal to me any longer, and I passed them on to my friend (poor dear). After ten years of “practicing” quilting, I finally put a binding on my first finished quilt in 1998. I still like appliquéing by hand, but my pieced quilts are all sewn by machine, and also quilted on my sewing machine. When asked about the best day of your life, most people would say it was the day they were married, the day their child was born, etc. For me, it was the day I discovered the rotary cutter. We’ve had a completely blissful relationship for many years. 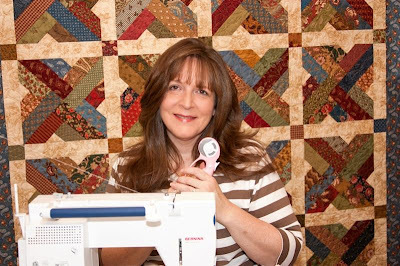 Please don’t be offended -- I don’t have children, and my husband was aware of my rotary cutter when we married. 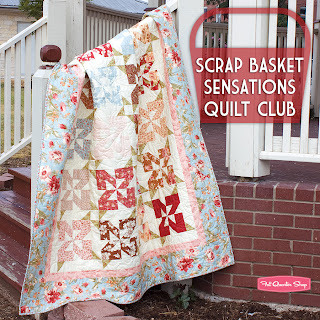 I hope you enjoy the Fat Quarter Shop’s Scrap-Basket Sensations Quilt Club! It's going to be fun! Garden Path is my favorite. Love the Town Square! Sure hope I win! Thank you so much for this wonderful giveaway! Congratulations! E-mail stephanie[at]fatquartershop[dot]com with your full shipping address to claim your prize. Now it is giveaway time! We will be giving away copies of Kim's Scrap Basket Sensation book to 5 lucky winners. To enter comment on this post telling me your favorite Jelly Roll we currently sell. Don't forget to stop by Kim's blog as she will be giving away one signed copy of her book.